University of New Hampshire professor Larry Mayer chairs a committee studying effects of the Deepwater Horizon oil spill. He started out as a boy fascinated with Jacques Cousteau, exploring the depths of his own bathtub with a snorkel. 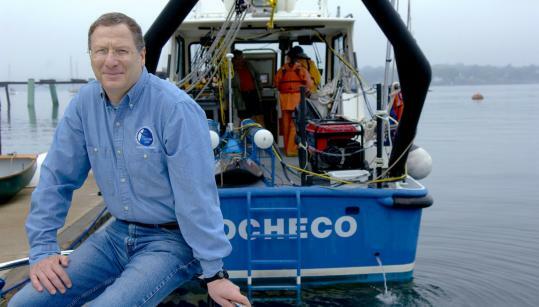 Today, University of New Hampshire professor Larry Mayer maps the ocean floor. And now, his expertise — cultivated over decades — has earned him a key spot on a national committee researching and analyzing the impacts of the largest oil spill in US history. Mayer, who directs UNH’s Center for Coastal and Ocean Mapping, has been selected to serve as chairman of the National Research Council’s committee to study the effects of the Deepwater Horizon oil spill on ecosystems in the Gulf of Mexico. Specifically, the group’s task is to evaluate and develop ways to quantify the short- and long-term effects the spill had on what are known as ecosystem services — the various processes and resources provided by natural ecosystems, ranging from the production of food and water to culture and recreation. “It’s looking at the benefits and resources that people get from the gulf, and what are the effects of the spill on these services?’’ said Jennifer Walsh, spokeswoman for the Washington, D.C.-based National Academy of Sciences. The task is being taken on by 16 pro bono committee members — culled mainly from colleges and research centers across the country — who will produce a final report by the end of next year. The group will meet several times; its first gathering was in January in Washington, with others scheduled for March 24 in New Orleans, and Aug. 2 in Mobile, Ala., according to the project’s website. But one that he’s been dealing with for some time, as he was on-site in the gulf with a team last May and June during the spill, and before the well’s capping. As Mayer described it, at the time, the area around the well was cluttered with ships of various sizes and capacities, and the water was sometimes a “glittery rainbow’’ from the oil. Working around the well and sometimes directly above it, his team used sonar and a device known as a fluorometer (which measures fluorescence) to search for a deep-water plume, thought to be roughly 1,150 meters (or just under three-quarters of a mile) down. His team also ran lines in shallower water to look for other plumes, Mayer said. Walsh noted this experience in the decision to appoint Mayer to the committee. In addition to Mayer’s overall expertise in ocean mapping, “he’s really familiar with the region down there,’’ she said. “Down there’’ means much more than just the Gulf of Mexico. In his work with the Center for Coastal and Ocean Mapping, Mayer and his team have been involved with sea floor mapping around an extended continental shelf; have completed sonars of the Great Bay Estuary between Portsmouth, N.H., and Durham, N.C.; and have undertaken three-dimensional mapping of sunken ships off the D-day beaches of Normandy. To learn more about the committee, visit www8. nationalacademies.org/cp/ projectview.aspx?key=49311.